Good morning, everyone, we are looking into umbrella stands for our facility. I am curious what type of stands other venues are using. Any suggestions are greatly appreciated. Do you know where the above comment came from? No idea, you say. Let us fill you in if that is your answer. Bob Eslick, operations manager of the south hall of the Von Braun Center posted it Friday morning on IAVM’s VenueNet. If you did know the answer, hats off to you as you are someone who takes advantage of the public and interactive member forum known as VenueNet. One of IAVM’s true jewels, VenueNet is the place where industry questions are asked and then answered by peers in the know. We might add that if you are an Allied member but not taking advantage of VenueNet, you are likely missing out on something even greater — potential dollars. Many of the questions posed have to do with products and services, which is where you, the Allied member, come in. Regardless of membership category, VenueNet is here to help you. “The thing I like about VenueNet is that everything that’s on your mind shows up there and you can get answers and people’s opinions on everything. It’s fabulous!” said Robyn Williams, CVE, Portland’5 Centers for the Arts. VenueNet works best when there is participation. Many members begin their day by browsing VenueNet to possibly not only answer a question but on occasion to even find a question that they thought of asking but someone else did first. 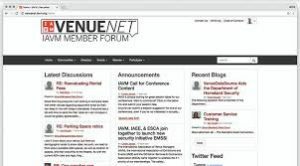 “VenueNet is a huge benefit to members who do use it,” added Tammy Koolbeck, CVE, Iowa State Center, IAVM 1st Vice Chair. Members are also encouraged to download and use the MemberCentric app in order to access VenueNet on the go through mobile devices, which many are already doing. Regardless of how you use VenueNet or where you use it from, the bottom line is to participate to help your colleagues and to get answers for your own questions or offer comments, suggestions, or recommendations. “It truly is one of the hidden treasures we have,” said Michael Marion, CVE, Verizon Arena, IAVM Chair of the Board.